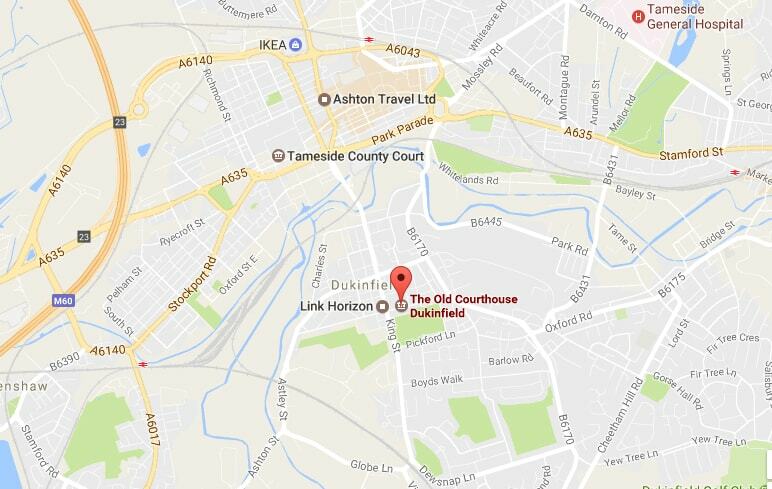 Looking for great quality Offices to Rent Tameside, just minutes from the M60, The Old Courthouse was a prison, later turned into a Magistrates Court before it was purchased from the Crown Prosecution Service (CPS) in 2001. In terms of offices to rent in Tameside, you’ll find us hard to beat on price and quality. Comprising of 6 master suites and a number of smaller offices, each suite has a structured cabling system which links back to a hi-tec communication room housed in one of the old cells. Potential tenants can enjoy a virtual turn key solution as telephone and computer facilities are all provided at source without having to worry about lead times from utility suppliers. Entrance to the building is by a custom key fob at the front door and further security is provided by special keypads at the entrance of each suite, so if you’re looking for office space near ashton, look no further. An intercom system is in place so that customers can alert you of their arrival for that important business meeting, and with 25 on site parking spaces and a free council car park at the back of the building, parking for tenants or clients is never an issue. Are you looking for Offices to rent in Tameside? The Old Courthouse is located in the centre of Dukinfield, Tameside just behind the Town Hall on Chapel Street. It is easily accessible via public transport links and for commuters looking to utilise the nearby M60. We are only a couple of miles away from Ashton under Lyne, very close to Hyde, Denton as well as other thriving local areas. Stockport is also a just short commute away via the M60, as too is Oldham which is around 10-15 minutes away by car. The Old Courthouse is a thriving business centre in Tameside, Greater Manchester with state of the art telecoms and internet facilities provided by Hosted Phones who are also based inside The Old Courthouse. All our suites are competitively priced and the building is secure with an electronic intercom system.